Whether the damage you are seeing is caused by changes in soil moisture content, weak native clay, or poorly compacted backfill, get your home back on solid ground through ECP’s nationwide network of certified contractors. Foundation failure is a significant (and costly) problem in its own right. But left unaddressed, even relatively minor foundation damage can lead to much bigger (and more expensive) repairs down the road. The best defense against escalating expenses is to scan for potential signs of foundation damage and address these issues as soon as they appear. Many of these signs often manifest in other parts of the home, usually several levels above the underlying foundation. Moderate wall and foundation cracks are typically 5-15mm in length, which equates to a width of .2”-. 6”. More serious cracks are generally above 15mm (.6”) or less. If you discover that fractures are horizontal, this may mean that an excessive amount of water pressure is impacting your foundation. Of course, some foundation cracks can be huge and grow to be 1-2” wide or larger. When insects or water invade these cracks, they can weaken an already damaged foundation. Improper water drainage is one of the leading causes of foundation failure. When soil surrounding the home rapidly expands (during wet spells) and contracts (during dry ones), this can lead to unnatural soil shifting — a process that places tremendous pressure on the underlying foundation. In addition to being a major cause of foundation damage, improper water drainage is also a telltale sign that foundation failure has already taken place. 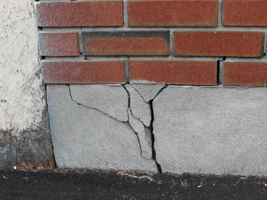 Cracks in the foundation can redirect water to lower soil levels, resulting in excessive moisture buildup around the property. If there is a change, leaks may exist behind the wall or underneath the floor. Call in both a plumber and foundation repair expert immediately — before the problem gets worse. Issues that originate in the foundation can sometimes appear in some of the upper levels of the home — often in the form of sagging floors or warped ceilings. Also, be on the lookout for exposed gaps where interior walls are supposed to meet with each floor and ceiling. With a level tool, verify whether the slope is consistent on each floor and ceiling. For a “low-tech” solution, simply grab some balls, any balls simply to see if minute gradients exist. When placed in random locations on every floor, the tennis ball should never move. Over time, floors that initially appear to be out of level by ½” or so, may become uneven by 1-1/2”-2”. To avoid hazards like this, have your foundation fixed as soon as possible. Foundation movement is something you’ll want to stop. All properties settle with time — it’s only natural. In fact, building materials are designed to “give” a little bit. But excessive settling is another common sign of foundation failure, with the most obvious symptoms manifesting as cracks, buckling and crumbling in the upper walls of the home. 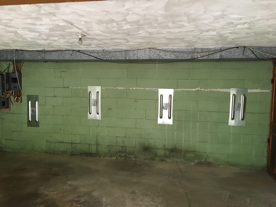 At ECP our certified contractors that live in your community can conduct these inspections, and show you the cracked or buckling walls, corners of the walls, pillars, joints, molding, and chimneys — all of which should be straight and flush. All of the windows and doors throughout the home should fit snugly in place — neither too tight nor too loose. Even when foundation damage isn’t to blame, homeowners should fix these problems right away. Improperly fitting doors and windows often lead to uncontrolled heat loss and unusually high utility bills. When conducting these inspections, don’t forget to include garage doors, HVAC vents, and attic windows.